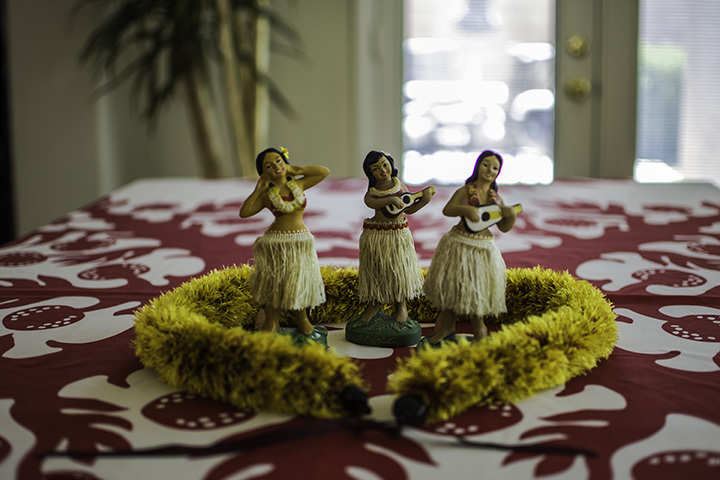 Hawaiian lei and hula dancer dolls. Leis have become one of the most well-known Hawaiian symbols for commemorating special events. However, Hawaiian lei making as well as giving and wearing leis are deeper than just mere symbols. This tradition came from Polynesian voyagers who traveled to the Hawaiian Islands by canoe. Leis are incredibly varied. While most make them from flowers and leaves, people can also make leis from shells, seeds, nuts and feathers. In the past, were even made from human finger bones, hair or teeth of various animals. Sometimes, the ancient Hawaiian made them to honor the gods or to celebration nature. Hawaiians wore also leis to distinguish themselves from others. They even wore them to symbolize the flow between beings coming together to create something beautiful. The maile lei had possibly the most significance. Warring chiefs used them in in peace treaties. The chiefs would stand on a heiau or temple and tie leis together as a sign of cooperation. Also, Hawaiians used them to pay tribute to gods and to celebrate the fruits of the land or sea. Today, leis are given to visitors in the true spirit of aloha. People also place them on the graves of loved ones or give them to those departing the islands. They are given on birthdays, on graduation days or at a festival or marriage feast. In the 1900’s when all of travel was by sea, departing locals would cast their leis into the water. They believed if their garland floated up on a beach, it would symbolize their safe return. For the most part, the wearing of a lei does not come with a long list of etiquette. However, there are a few noteworthy points. A lei should be a celebration of affection from one person to another. So it would never be proper to refuse a lei. A Hawaiian proverb says “E lei no au i ko aloha” meaning “I will wear your love as a wreath.” In the same way, it’s impolite to remove the lei in the presence of the person who gave it to you. Many wear leis like necklaces. But the right way to wear it is to drape it evenly over the shoulders. Leis are available everywhere in Hawaii. In the 1950’s, most people bought leis in Honolulu and Waikiki for as little as 25 cents. Later, lei stands at airport sold leis those wanting to give them to people arriving or leaving Honolulu by plane. Today, most locals on Oahu buy leis in Chinatown. 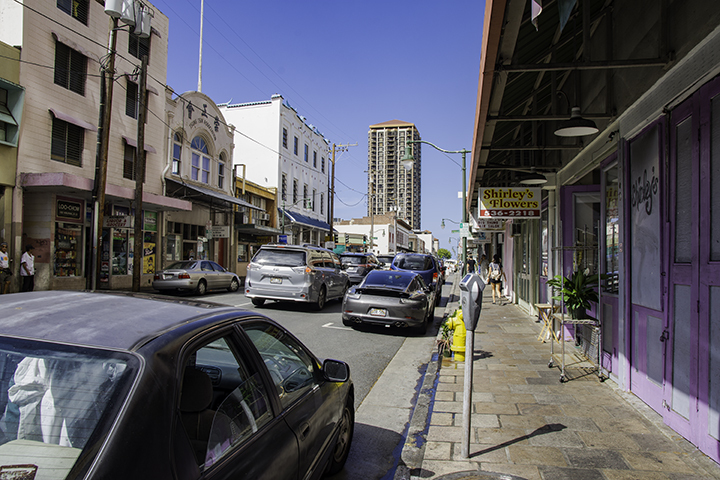 Maunakea Street in Chinatown, Honolulu, where you can purchase Hawaiian leis. The floral-rich season of spring brings a new enthusiasm to lei giving. Each May 1st, many people in Hawaii make and wear leis. May Day is Lei Day in Hawaii. There are many ways to make leis. One is the wili or twisted method. It involves winding the flowers, leaves or ferns around a core of twine or the midrib of the coconut palm. Another way is the hipu’u or knotted fashion. While the hili style uses braids. Other methods include: humupaya (sewed backing), kui (strung with a needle) or Miconesian-style (tied or woven flat). Lei makers commonly use flowers like pikake, white ginger, tuberose, plumeria or orchids. May certainly is a prime time to plan a Hawaiian vacation for anyone who wants to enjoy the aroma, decoration and the beauty of Hawaiian leis.